IT solutions providers and value-added resellers, do you ever feel that you are turning away service projects because they are within your strategic vision but outside of your core service offerings? Would you like to extend your solutions into greater services? Consider augmenting your core competencies and expanding your professional reach by leveraging strategic services partnerships. Let’s face it – these days, hardware profit margins are razor thin. Public cloud adoption continues to grow, and is slowing down hardware sales. Adding professional services capabilities can help you cover more of a client’s needs, which help to keep the customer looking to you as a knowledge and thought leader, and not just another VAR. Just look at how IT management is breaking down their budgets. 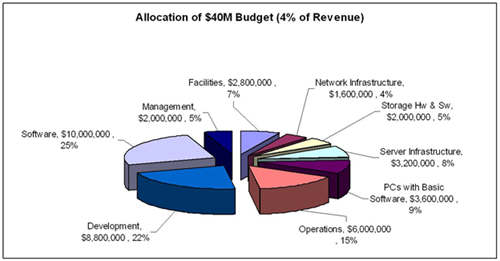 In this example from Wikibon, a model of the IT spending of a $1.0B company was developed. The physical infrastructure hardware spend of this annual budget totals just 17% of the overall IT spend, while business drivers, such as software, development, and operations tops over 60%. In most shops, the infrastructure underneath the data and operations systems are seen as a necessary evil and a traditional cost sink. Business drivers, on the other hand, are thought of more in the light that they can help generate and sustain more business. Think about how much of these business driver costs come from within versus consulting dollars. How much of that slice of the budget would you like to get as an outside consulting entity? First, determine your core competencies, and look forward towards the future of your business. What directions is it naturally gravitating towards? What areas do you want to target, and how efficient is it for your business to expand? Now, can the business sustain the overhead of staffing to move towards those goals? It’s harder than it looks. Strategic partnerships fill these voids with no overhead. You deliver your client’s needs with expert delivery, retain the business, and the partner is happy to perform the services under you. Heraflux Technologies’ premier consultants are among the most respected professionals in the data industry, and our practice areas can easily be leveraged to augment your services and help boost your sales pipeline. Our Partner Program allows you to add our expertise in the convergence of data and infrastructure into your service lineup. Does forming a strategic partnership with Heraflux sound like it could help your business? Contact us today to schedule a discussion to explore the ways that we can help you.